U.S. Sen. Ed Markey, of Massachusetts, joined striking Stop & Shop workers in Quincy on Monday. Thirty-one thousand workers from more than 200 stores in Massachusetts, Connecticut and Rhode Island have been on strike since April 11. 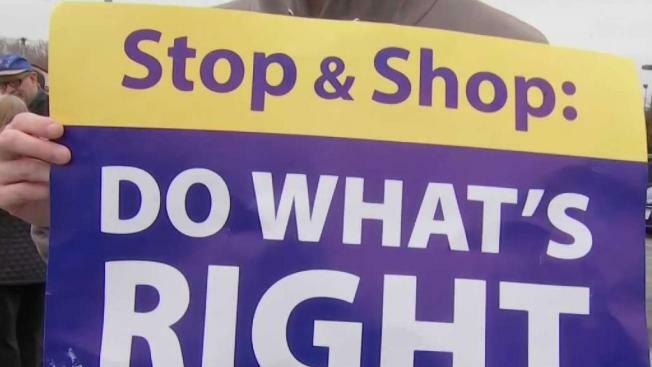 U.S. Sen. Ed Markey, of Massachusetts, joined striking Stop & Shop workers in Quincy on Monday, in a show of solidarity. Thirty-one thousand workers from more than 200 stores in Massachusetts, Connecticut and Rhode Island have been on strike since April 11 over "unreasonable" wage and benefit cuts, something the grocery chain denies. "Their strike is a strike for pensions for health care, for their wages. They have to be protected," said Markey. The senator is the latest politician to show his support. U.S. Sen. Elizabeth Warren joined the striking workers on the picket line at the Stop & Shop on McGrath Highway in Somerville on Friday morning. 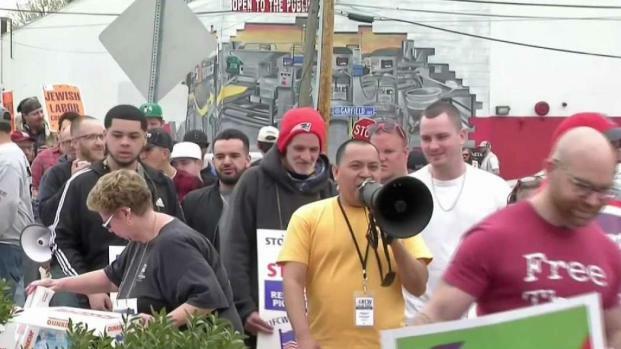 The strike started Thursday when more than 30,000 workers from more than 200 New England Stop & Shops walked off the job. "The fight that they're fighting, the support that they're getting, is something that just sets a standard for a country where prosperity is what we are enjoying right now," said Markey. "A company that is enjoying profits, cannot then turn to its workers and say, 'we're going to be cutting the benefits, cutting the opportunities which were given to these workers.'" Company officials maintain their wages, pensions and benefits are competitive. The United Food & Commercial Workers (UFCW) disagrees, which has resulted in the current impasse. On the picket line outside the Halifax, Massachusetts store Monday, workers there said they are staying put, despite what they could stand to lose. "What they're putting out there about what we're asking for is wrong," said Dan Deveau who has worked for Stop & Shop for 14 years. "The telling half-truths." Some say they are now worried about automation and losing their jobs to Marty, a robot that Stop & Shop uses to detect spills in the aisles. "They have bigger plans for it obviously. It's going to be able to maybe do some inventory preparation," said Cathy Gray who has worked for the company for 32 years. At the Halifax store, only the pharmacy and bank are open, forcing customers to shop elsewhere the week before Easter. "They're losing people. And they'll be lucky to get some of them back after it," said Deveau. "They're really gambling here."